The death of Benjamin Sturtevant's only son, Charles, in 1879 insured that upon his passing a new name would be associated with the firm, that name was Eugene Foss. Foss, a son of a factory manager, was born September 24, 1858 at West Berkshire, Vermont. He attended the University of Vermont for two years before going West as a salesman for a lumber dryer company. The success he had with the dryer, but more importantly goods he took up incidentally, the products of the B.F.Sturtevant Co., attracted the attention of Benjamin Sturtevant. Foss soon accepted an executive position at the Jamaica Plain plant. In the classic way, his situation improved dramatically. Foss married one of Sturtevant's daughters, Lilla, in 1885 and upon the death of the founder became Treasurer, General Manager and principal owner. In addition to overseeing the company's product and territorial expansion and his own extensive business investments (including a rival fan company, the American Blower Corporation), in 1902 he gave up active management of Sturtevant to begin his political career. Following in the footsteps of his brother George, an Illinois congressman, Foss launched a failed congressional campaign as a Republican Progressive, harping on his single issue, trade reciprocity. The surprising closeness of his loss, though, showed that he had arrived politically. 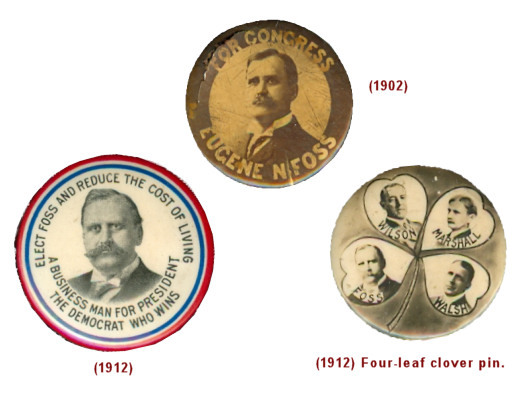 In 1910, the state Democratic leadership was looking for a wealthy Progressive to fund their return to the Governorship. Foss opportunistically switched parties and the Republicans, who viewed him as an annoyance, were equally pleased to see him leave. Riding a nationwide Progressive wave, he was narrowly swept into office for the first of three one-year terms as Massachusetts governor. Labor issues were a dominate theme in Massachusetts politics. During the nationally followed 1912 Lawrence mill strike, Governor Foss dispatched twelve companies of the Massachusetts Militia while pressuring factory owners to make progress in settlement negotiations as a condition of the troop's continued presence. The Governor succeeded in instituting a system of compensation for injured workers. He advocated campaign spending limits and increased the number and compensation of state judges. Toward his final term, relations between him and the Democrats were poisoned due to everpresent ideological differences. The B.F.Sturtevant Co. got caught up in the furor when labor unions threatened to shut down the Hyde Park plant in 1913 due to his increasing Republican bias and the company's decision to move part of its work to a factory in Galt, Ontario to avoid the tariff. In spite of the dissonance, nothing came of the threats. A failed run as an independent candidate on a Prohibition platform in 1914 marked the end of his public career. He left office politically dead. With a third loyalty switch, now back with the Republicans, Foss seemingly settled into the roll of an ex-pol, serving as political dressing at Party events. But the political chameleon inside him wouldn't rest! For some inexplicable reason, he choose to run in 1925 as a "Coolidge-Democrat" in the 5th Congressional District. In an election historic for electing the first woman to Congress by any New England state, Foss had his head handed to him. Losing to Republican Edith Rodgers by a huge margin, he couldn't win a single district. Governor Foss died at his Jamaica Plain home in 1939. The Governor and Benjamin Sturtevant are buried in abutting plots at the Forest Hills Cemetery.